This article shows how to reorder or move pages and sections in the Site Center's Pages tab. Two orange dots appear when the mouse cursor is placed over sections and pages. Objects can be moved to the desired location by clicking these dots and dragging and dropping items to the desired location. Note: Items can only be dragged and dropped inside their current sitemap level. To move items above or into another item, use the Move button. 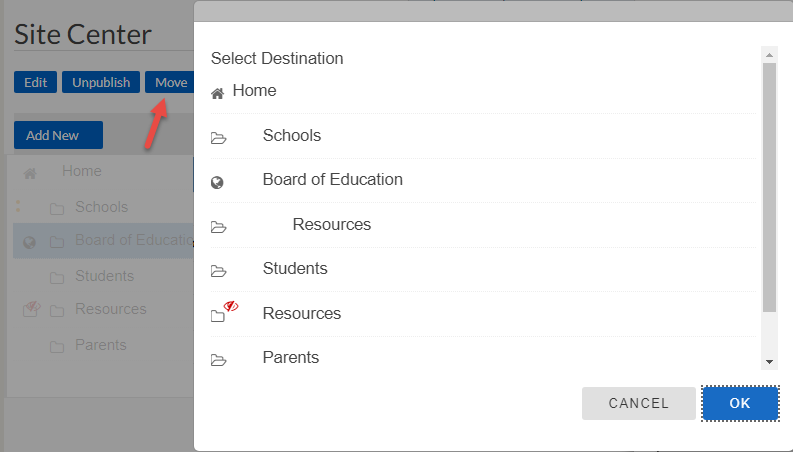 Select the desired section or page to be moved. Choose the destination from the list that appears.